PattyC: I just don't give a hoot !!!!! Great projects ! I love owls. Your projects are all terrific but I have to say your owl sewing cozy is my favorite ... organization always wins me over ;) Thank you so much for sharing!! Love your projects! That tiny embroidered owl postcard is amazing. Thank you for sharing. I love that owl postcard! The stitch is just beautiful! Great work on all your projects! These owls look terrific. And so does the peacock sewing roll. A wonderful project! Lovely creations. Thank you for sharing with us. What beautiful projects. Thank you for sharing! I love your owls! Love your embroidered owl, the feathers in her chest are so neatly stitched, congrats on great work, and your needle book is just adorable. Thanks for sharing! Wonderful projects, all of them. That owl is adorable! So many lovely and cute birds! 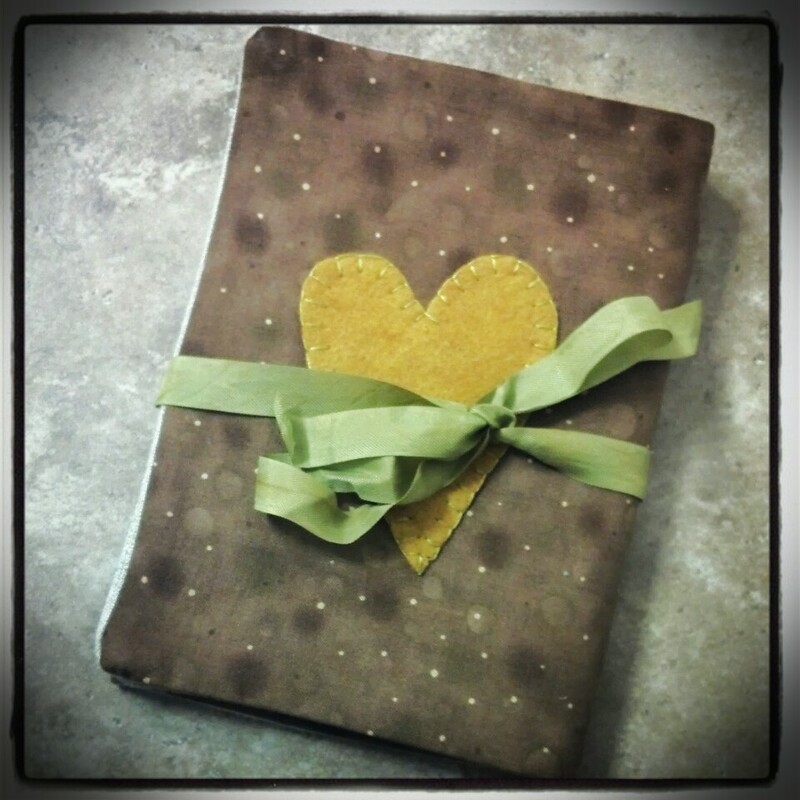 Great post with wonderful projects ~ I do swear, you must never sleep!! Beautiful work. Peacock turned out great. Love that felted owl. Wow so many beautiful projects, it's hard to choose a favorite! But I think the owl sewing companion takes first place for me lol. You have been busy. I love the owl you stitched. Thanks for sharing all the projects. I wish my satin stitching looked as good as yours on that beautiful owl!! i love the bird house..
owls are always so cute!! Thank you for sharing your lovely projects - I especially like the owl! Oh my goodness your owls are SO cute!! Ah, now my son would disagree on that, he does find the ostrich a beauty. He considers one at our local zoo his pet and she visits with him at the fence :) Your stitching is beautiful...love your work! Gorgeous projects and your owl is adorable! Great post and wonderful projects! Your little owl is adorable! Love your owls and beautiful peacock sewing roll!! Beautiful stitching on your postcard owl! What a fun little guy! And that sewing companion, now just how cute is that? I love your owls. Thanks for sharing, and sharing the links. 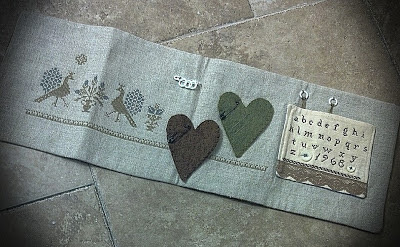 Love your projects especially the embroidered owl. Fabulous stitching. Patty, your work is just so beautiful! Love that owl postcard! What cute projects--I love the mismatched eyes on that owl! 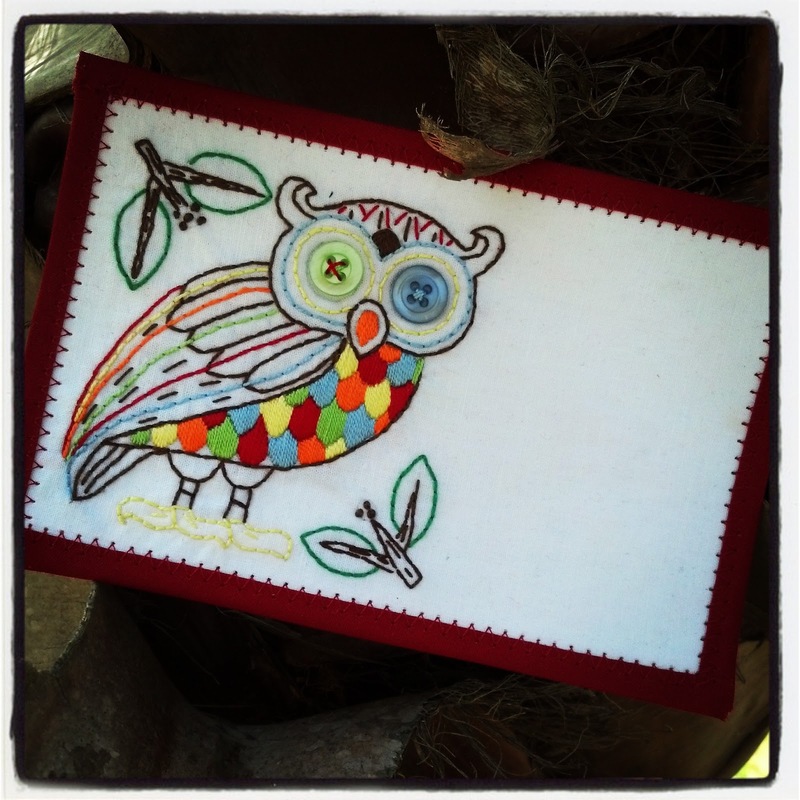 so cute projects and your owl is so perfect stiched, beautiful! 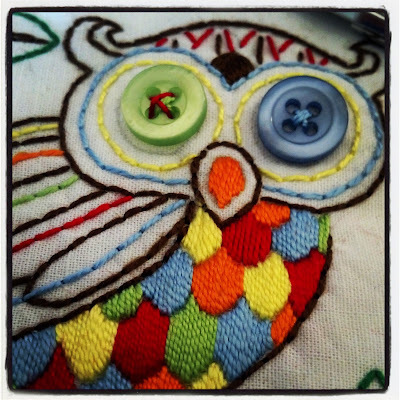 Your owls are so cute and your stitching is incredible--so well done! Hi!!! I love your owls!!!! Love the postcard!!! So bright and cheerful!!! Love the containers too!!!! Oh,my. I love your satin stitched owl. Such a cutie! I love that owl...wow! Putting it on a postcard (I love Annie's cards, too) was a great idea. Love all those cute projects you shared! I'm in love with your postcard owl! You made great projects, but that owl makes my jaw drop (not a pretty sight). Thanks for showing your birds. You've been busy haven't you!! Wow. I love your owl and how colorful he is and the rest of your projects look like they've been fun to work on. What wonderful projects you are sharing today. I think owl-livia is probably my favorite but so is the first owl you shared. Did you fabric color on the post card? Hope the pretty kitty didn't get the birdie, beautiful projects, your stitching is awe inspiring. that owl IS a hoot!! love the two different buttons as eyes, clever! Love your projects, especially the felt owl holder. Great job on your stitchery! All your projects are terrific - your stitching is really nice!! I love the primitive peacock sewing roll. Great projects. Your satin stitching on the owl is amazing (and I'm so jealous). Beautiful projects today and congrats on being one of the top Peeps today! And who says ostriches are not beautiful (haha)! And I love your pretty cat too! Great Owl. I love Annie's postcards too and was lucky enough that she sent me one once. Great projects, especially love the sewing cozy! LOL! 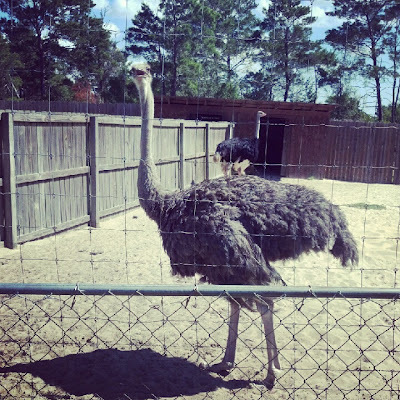 Loved the photo of the ostriches! Beautiful projects all, especially the owl. I am a fan of Annie's too. You did some wonderful "bird" projects. I love the owl kit. The postcard is gorgeous. Thank you too for being part of the hop. Beautiful work , I love owls ! Thanks for sharing all those wonderful birds. Each was cuter than the last. Love the owl...your embroidery is excellent...Congrats on it being selected today in the top group! Wow! Fantastic projects! You are so creative! 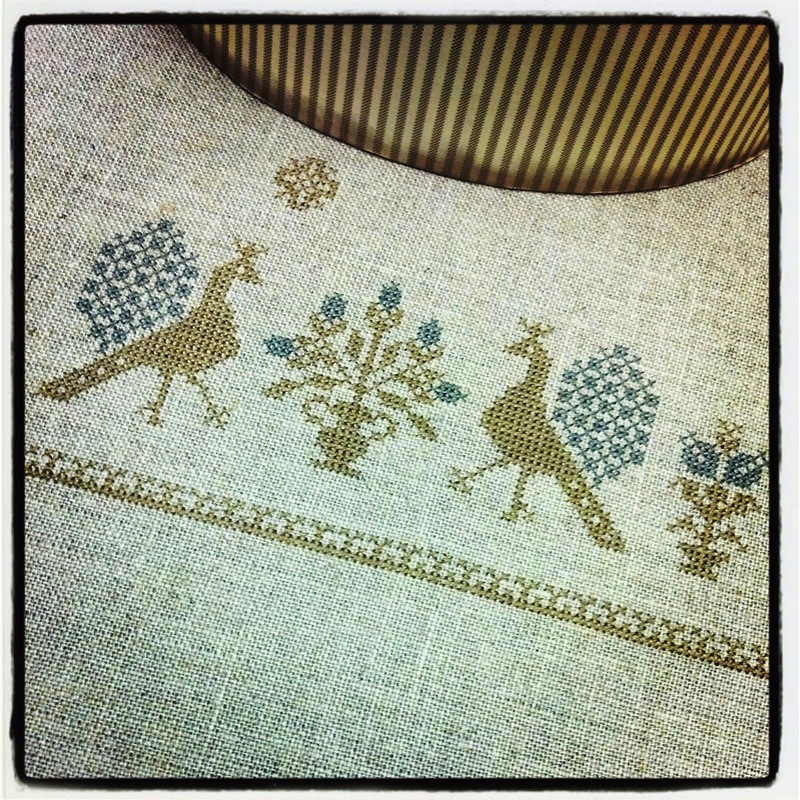 I really love your projects, fabulous embroidery! Trouble looks precious! great projects! love your owl caddy. 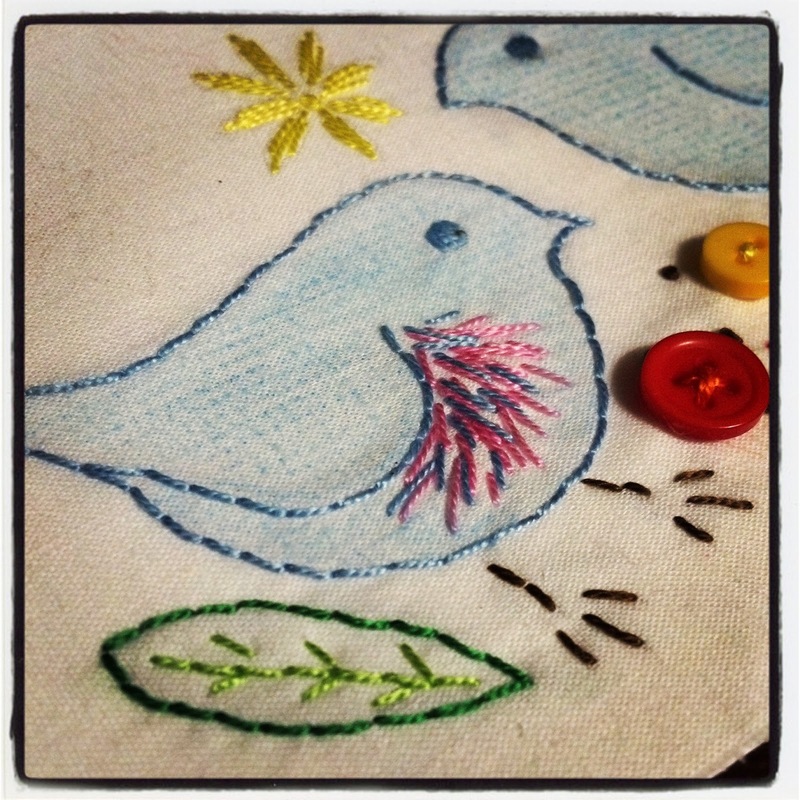 Very pretty birdy projects. Love all the needlework. You've made so many wonderful bird projects. The colorful owl is wonderful but so are the blue birds on the postcard. The sewing assistant owl is wonderful - what a wise decision! :) Never heard of a sewing roll - it's really lovely. You've been busy. Lots of cute projects and my favorite is the embroidered owl. Wow...so cheerful! The embroidery on the owl is fabulous and well deserving of a top spot. I love all of your projects. love all of your birds, especially the owl. You do beautiful needle work. I Love the embroidered owl postcard. Wonderful colours and precision stitching! Whoooo would have thought? Your bright little owl just speaks volumes to me. Now don't get me wrong I love the other stitchery birds too ... but #1 is beyond cute!! Thanks for sharing them with us. I wish I had 10% of your creativity! 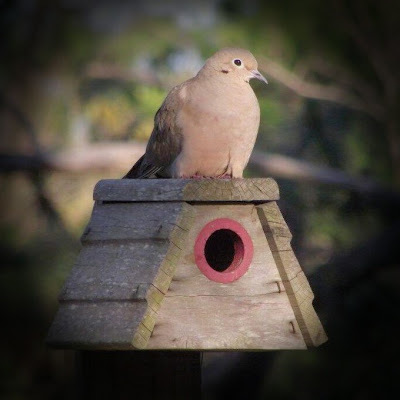 Love this post full of beautiful birds! This post has been super! You should check again and again!